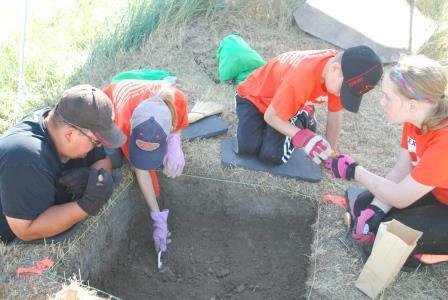 The South Dakota State Historical Society’s Historic Preservation Office is sponsoring a three-day Archaeology Camp for students going into grades 4-6 for the 2017-2018 school year. Camp dates are June 20-22, from 8 a.m.-5 p.m. CDT. The program is structured for students to attend all three days. In addition to excavations at the site, other activities will include processing artifacts and practicing with atlatls (ancient weapons that preceded the bow and arrow). There will also be trips to the Turtle Effigy and the Oahe Chapel along with tours of the archives and museum of the South Dakota State Historical Society at the Cultural Heritage Center. The registration fee is $30, and registration begins at 8 a.m. on May 22. It will close on May 26 or when the camp is full, whichever comes first. No walk-in campers will be accepted on camp days. Registration information is available at history.sd.gov/preservation. Click on the link at the top of the page. Forms may also be picked up in the administration office of the Cultural Heritage Center, 900 Governors Dr. in Pierre. For more information on the Archaeology Camp, please contact Paige Olson with the historic preservation office at (605) 773-6004 or at Paige.Olson@state.sd.us. For more information on other historic preservation programs, contact the State Historic Preservation Office at the Cultural Heritage Center, 900 Governors Drive, Pierre, SD 57501-2217; telephone (605) 773-3458, email shpo@state.sd.us or visit history.sd.gov/preservation.